The Vietnamese illegal ivory trade is now one of the largest in the world. Of all the ivory industries in Asia, Vietnamese carvers have multiplied in number and increased their production of illegal ivory items the most rapidly since 2008. Tusks are smuggled into Vietnam, nearly all from Africa, with only a few nowadays from domesticated and wild elephants in Laos and Vietnam. In early 2015 the largest proportion of tusks was seized o cially in Haiphong; this changed to Danang in the latter half of 2015. Wholesale prices for raw tusks in Vietnam were about the same in 2015 as in mainland China, around USD 1,100/kg for a 1–3-kg tusk. Historically ivory carving was an insigni cant art form in Vietnam. While Vietnamese ivory carvers have increased greatly in number, we did not hear of any foreigners working ivory in Vietnam. Ivory artisans earn on average USD 260 a month, considerably less than in mainland China. We talked to ivory carvers in Ho Chi Minh City (HCMC), in Buon Ma Thuot and in three northern villages who were optimistic about their business. Legislation prohibiting the ivory trade in Vietnam remains unclear. A loophole in the law allows worked ivory cra ed before 1992 to be legally sold in Vietnam, although with the current weak law enforcement, nobody mentioned this to us, nor did hardly any vendor mention to us that exports were illegal. We saw no posters or other public notices in Vietnam publicizing that the trade in ivory is illegal. In HCMC, Hanoi, one town and village in the Central Highlands, and two villages in the north we counted 242 open outlets with 16,099 ivory items on display, for retail sale. Of these items, 9,893 (or 61%) were in onenorthern village that had not been counted before in a survey. Nearly all the ivory items for sale in Vietnam are new or recently carved and illegal. Vietnam has one of the largest number of newly worked illegal ivory items openly o ered for retail sale in the world. Most objects are pendants and other small items, usually jewellery. Hardly any expensive ivory items for retail sale were seen. The most expensive new item was a 17-cm human gure for USD 2,500 in HCMC. The most expensive old items were a carved tusk and a large urn for USD 20,000 each in an antique shop in HCMC. 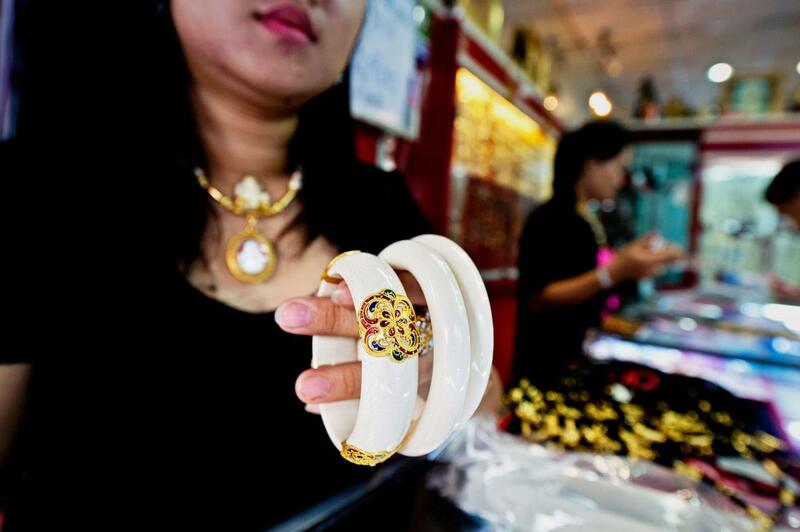 The cheapest ivory item was USD 2 for a thin ring in one northern Vietnam village. Retail ivory prices for common comparable items were three times more in Beijing and Shanghai than in HCMC and Hanoi and seven times more than in a village selling the most worked ivory seen in Vietnam. This is due to cheaper labour in Vietnam, fewer overheads, and nearly all illegal items for sale that require no expensive paperwork. There appears to be little law enforcement within Vietnam against the illegal ivory workshops and retail shops, especially in the smaller locations that few Western foreigners visit. Nearly all the customers we saw shopping for ivory were from mainland China; they particularly like to visit Vietnam’s northern villages to buy ivory items, both wholesale and retail, as the prices are considerably lower than elsewhere in the country. The chances of Chinese being arrested for carrying illegal ivory items crossing the border from Vietnam into China are extremely small due to ine ective law enforcement. A growing online illegal ivory trade is expanding among Vietnamese and mainland Chinese. Other elephant products are sold wholesale and retail in Vietnam, especially in the western region nearer to Cambodia and Laos. Products include bones, feet, hairs, meat, molars, skin and tails. We saw no raw mammoth ivory and only one item for sale: a pendant. In 2008 a detailed survey of Vietnam counted 2,444 ivory items on view for sale. In 2015 our survey found this number had risen by 6.6 times. A main reason was the expansion of ivory carving and sales in one particular village in the north to meet demand from mainland Chinese,and an increase in ivory items for sale in the Central Highlands area of Buon Ma Thuot to meet demand for the growing number of Asian tourists going there. While the illegal rhino horn trade in Vietnam has been heavily criticized, its recently booming ivory trade has been largely overlooked due to a lack of information about it. Corruption and mismanagement in Vietnam have abetted this expanding and ourishing illegal ivory trade, allowing retail displays to remain wide open and enabling smuggling of the many Vietnamese-carved illegal new ivory items into mainland China.